After surprisingly waking up alive after spending the night in a Queens basement we decided to head back to JFK. JetBlue has a fun style, I'll give them that. It was snowing at JFK which again made me feel like our decision to flee to the Caribbean was genius. Actually leaving the ground took forever as all of the planes had to be de-iced. Maybe the runway did too. When I'm sitting on the runway one part of my trip routine is I google the county's currency conversion and take a screenshot. Sometimes getting a cab on the other end is hectic and I feel like it makes it less likely that I get hoodwinked. Maurice Bishop International Airport is right on the coast so we got a lovely view of Grenada's turquoise waters on the way down. Before this trip telling people we were going to Grenada they always assumed we meant Granada, Spain. Even more confusingly here the locals pronounce it Grenéda. There's apparently only so many place names to go around. 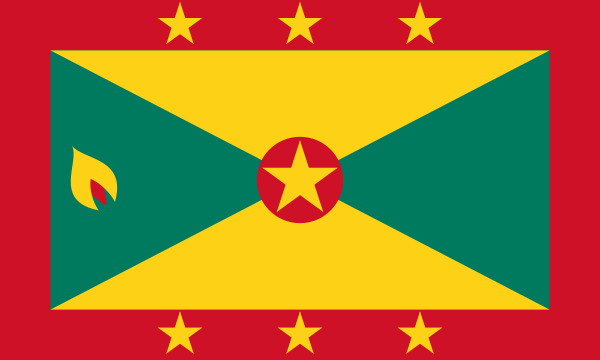 Speaking of names the capital of Grenada is St. George's. Permanently possessive. The passport stamp left a lot to be desired. My cab worries were instantly dissolved when I laid eyes on this beauty. It was covered in awesome decals. One right by the license plate is a nutmeg. 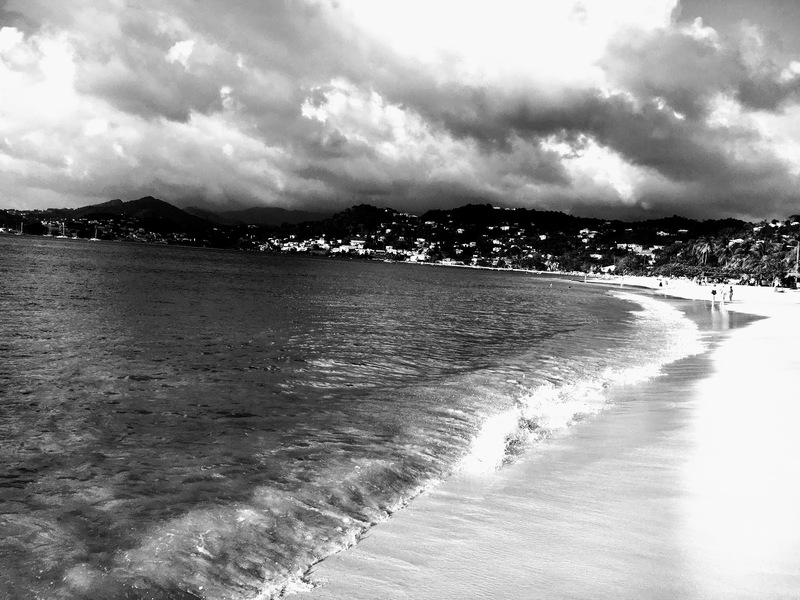 Grenada supplies some large percentage of the world's nutmeg and they are proud of that fact. On the Grenadian national flag that thing on the left, which a week ago I would have guessed was a flame, is in fact: a nutmeg. When I saw the interior I half-expected to begin some sort of Cash Cab-esque game show. 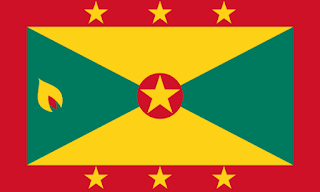 I engaged our driver Harold in some BS small talk and it turned out that today was general election day in Grenada. I asked him if he was voting today and he smiled and showed me his ink-stained voting finger. "I like to talk, and if I don't vote I can't talk". Give Harold a call if you want to drive around in a taxi from a video game. We stayed at a nice little spot called the Sea Breeze Hotel in Grand Anse. I was stuck on this election thing, so I asked the lady at the hotel front desk where the winners of the election would be celebrating tonight. She replied "the airport". Huh? In a lot of countries it's usually the election's losers who hastily make their way to the airport. We dumped our bags and took a stroll to get a bite to eat. Umbrellas Beach Bar was right on the beach. Where you might expect. Lydia and I were ready for some piña coladas when a tragedy struck that shook my belief in democracy to the core. To "lime" is Caribbean English for "hang out". The bar was surprisingly decked out for St. Patrick's Day. I settled for a virgin nutmeg milkshake. So nutmegy. Lydia went for the lambie fritters. Lambie is the local word for conch meat. I didn't mind the flavor but the dough ball thing wasn't fried enough and was too mushy for my taste. We strolled over to the nearby Spiceland Mall for some provisions. It was unfortunately also suffering in the iron grip of democracy. The local lemons looked like they had a cauliflower somewhere in their family tree. We were walking along this big drainage ditch on our way back to the hotel and spotted a big crab hanging out down there. Now that I was paying attention I noticed this was a complete Shire of little crabby hobbit holes. They were super skittish and would pop back into their lairs if we made the slightest sudden move. We hit a different supermarket once the beer curfew had been lifted. Freedom! They had a few different kinds of nutmeg syrup next to the maple syrup. The hot cocoa was some legit looking balls of fresh cocoa with some equally fresh looking cinnamon bark. Later that night we discovered the gem that is Esther's Bar. What it lacked in outdoor lighting it made up for in hospitality. I upgraded my dream to banana colada. Piñas are for squares. It came with some obligatory fresh ground nutmeg on top. The nearest fancy hotel was the Radisson. We popped over to make sure that we weren't missing out on anything. They did have a steel drum band playing which was fun. Lydia went for whatever was already being blended. Radisson bartender: "It doesn't have a name. It's my invention." I ordered something from the menu. I learned that bango = banana + mango. The bartender blended it, tried it, then added grenadine. "I fixed that for you". Clearly in the pocket of the Grenadian grenadine lobby. I asked the bartender about the election results. "Did the good guys win or the bad guys?" "They all start off good then turn bad when they get elected." We could hear a lot of honking at night, we assumed that the votes had been tallied and the celebrating was underway. And that's the story of what I ate and drank on this particular day and the animals I saw in an open Caribbean sewer.